As much as I love vegetables, whole grains and water, I have to admit that I'm a sucker for anything creamy, cheesy, crispy and rich. Luckily my parents raised my sister and I to pretty much eat anything that was put in front of us (although I still can't eat natto) so I love a wide variety of foods. Sure, nothing beats a freshly picked tomato with just a sprinkle of good sea salt and drizzle of olive oil on a hot summer day, but I could eat onions rings any day of the year. Ditto for pizza, tuna toast, croissants or foie gras. Who needs a good excuse to eat fat? This girl needs none, although fear of obesity is a pretty good motivator to keep the fat intake at a reasonable level. To fulfill my need for creamy, I made risotto for Easter a couple of weeks back. Since there was quite a bit leftover, I simply tossed it in a tupperware and put it in the freezer, knowing exactly what I'd do with it. 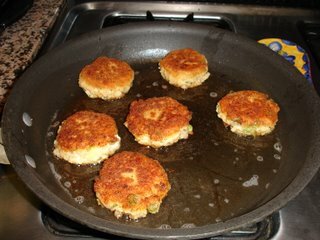 I think, subconsciously, I made the risotto for Easter knowing that I could reincarnate the leftovers into the one thing I'd been craving for a long time: risotto cakes. 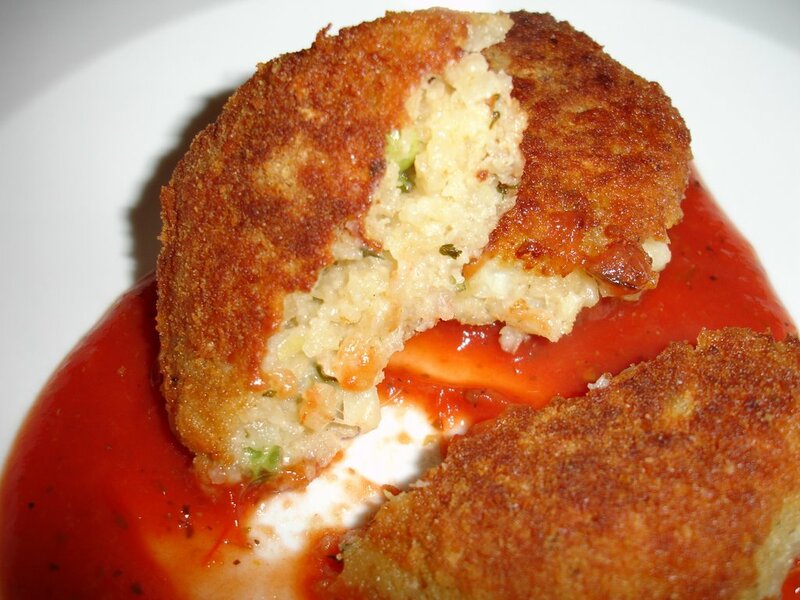 I mean, what's to dislike about cheesy risotto, breaded and fried and swimming in a pool of warm marinara?? Nothing, I tell you. Although I've had risotto cakes in various restaurants, I had never made them myself. Now was my chance!!! I took the defrosted risotto, diced some of the larger pieces of shrimp in it and added some grated pecorino romano. I also added one small, beaten egg and then patted the mixture into 1/4 cup-sized cakes, which proved a bit messy but I got the hang of it after the 4th one. 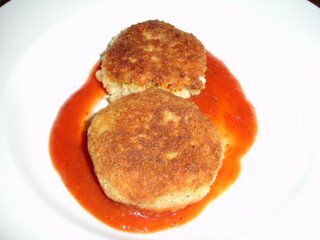 After dredging first in flour, then egg, then breadcrumbs, I shallow fried them in some canola oil and then plated them with the marinara. The end result was everything I had ever dreamed of- a crunchy, crispy shell which broke open to release the hot, creamy risotto. I can't even tell you how good it was! I think I will have to make risotto more often simply to have the chance to make these cakes again. As Robyn would say, "INNARDS!"